The Diocesan Altar Guild Sewing Room in California began some sixty or more years ago. It was a major source of church furnishings in the Diocese when it extended from Santa Barbara to the Oregon border. During the 1950s and 1960s, when new churches were being built and many older churches were updating their old vestments and paraments, the Sewing Room was very busy. Back then, about thirty ladies would gather in The Guild Room at Grace Cathedral from Monday to Friday and make hundreds of items, many with exquisitely embroidered designs. The accounts from those earlier days show an incredible amount of industry from such dedicated hands. More recently, following Joan Chloupek’s retirement from the Sewing Room in the late 1980s, Dee DiSoma took over as chairperson. By then, work was undertaken on Mondays only, as fewer women were available to volunteer as much time as they had in years past. 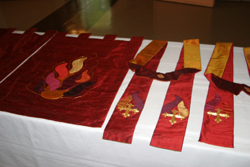 A small handful of volunteers made the red stoles given each June and December to new ordinands by Bishop William Swing. As time permitted, some small linens were also made. Following the 1989 Loma Prieta earthquake, damage to Grace Cathedral required the Sewing Room to move to space donated by St. Stephen<0x2019>s Church, Orinda. When the Cathedral retrofitting was complete and the crypt once again safe, the Sewing Room returned to San Francisco. A few years later, Dee retired from her position. In 1998 Marjorie Pettyjohn assumed the chairmanship and continues to lead the small group of faithful stitchers today. At about the time of Dee’s retirement, Bishop Swing halted presentation of priests’ stoles at ordination. The Sewing Room stitchers had time to look to other needs in the Diocese. One of the first projects was to produce a pattern for diaconal (St. Stephen’s or Byzantine) stoles. It was the Archdeacon for the Diocese who approached us with the request to make red Byzantine stoles for the next group of diaconal ordinands. He explained that the School for Deacons wanted to differentiate permanent deacons from transitional deacons who typically wore straight diagonal- or sash-style stoles. We have been making Byzantine stoles ever since. Currently, there are five regular Sewing Room members who have been working on (1) making new vestments, (2) making linens, such as purificators, lavabo towels, corporals, custom-sized fair linens and credence tablecloths, (3) repairing vestments and linens, and (4) restoring old vestments, in some cases evaluating them for salvage possibilities. 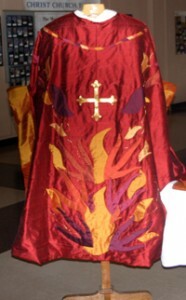 Projects completed over the past ten years include a glorious set of Pentecost vestments for St. Bede’s Episcopal Church in Menlo Park, as well as a green set and a white set of vestments for St. Augustine’s in Oakland, and many altar linens for various churches. On the election of Bishop Marc Andrus in 2006, the DAG presented him with a cope and miter based on the theme of St. Francis and the diverse Bay Area. The design of the cope and miter was inspired by the needlepoint seat cushions in the Cathedral choir stalls, a DAG-sponsored project of the late 1990s. The Sewing Room closets also hold a large number of items that have been donated over the years by churches upgrading their inventory, or sadly by those that have closed their doors. We have been able to send help from these stores to Central American countries devastated by earthquakes and floods, and following Hurricane Katrina we sent about a dozen boxes of vestments to New Orleans for distribution to the devastated congregations. In this last venture, Crystal Cleaning Center in San Mateo cleaned hundreds of items at a discount and United Parcel Service gave a nice discount for shipping all those boxes. There is always room on Mondays for those who care to join this fun group. 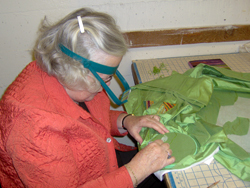 Please call Marjorie Pettyjohn (510) 559-8431, or call the Sewing Room on a Monday 10am-3pm at (415) 440-6100. Not only would we love to see more Bay Area sewers, but we will gladly help, wherever you are, with design and construction of vestments and paraments to meet your parish needs.